Here’s the spicy truth behind salsa. It’s no ordinary condiment. It’s an ancient Aztec recipe that was revealed to the world through the written word of a Franciscan missionary. One who had lived with the Aztecs and learned their ways. So let’s treat National Salsa Month, in May, with reverence. Bow to this ancient recipe and give in to our taste buds. Try out as many different types of salsa as you can. Trust us, the month will end but you will not run out of new and tasty recipes to try. That’s how hot salsa is all over the world. Tortilla chips and salsa became the official state snack of Texas. The U.S. Department of Agriculture designated salsa as a vegetable in order to get more and more schools to serve it to children. National Salsa Month was created to celebrate the 50th Anniversary of Pace Salsa . Move over ketchup — salsa became the nation's largest selling sauce. Get a little crazy this month. Don't just use salsa as a condiment. Flavor curries. Use it as a marinade or a spread. How about spiking a cocktail with salsa? If your recipe wins you get a prize. And if you lose you still get to eat salsa. It's a win-win! Fans of salsa post pictures, recipes, fun facts, and more this month. Don't be left out. Salsa, the dance, actually takes its name from the real thing in order to emphasize the spiciness of the moves. It's a robust mix of Hispanic, Caribbean, and African dance styles. Yes, Pico de gallo literally means rooster beak salsa. Perhaps because this chunky salsa was eaten with the thumb and forefinger that resembled a pecking rooster! Every year Pace Foods uses 22 million pounds of fresh jalapeno. That's more than any other salsa company in the U.S! Traditionally, salsa is prepared with a mortar and pestle made from black volcanic rock. These are used to puree the tomatoes and chilies with other ingredients. Relish, like salsa, is a condiment used to increase the flavor of foods and can be eaten cooked or raw. The difference is that the word 'relish' is French and 'salsa' is Spanish. European sisters! And National Salsa Month is the perfect time to make it. Salsa comes in as many different forms as there are people. 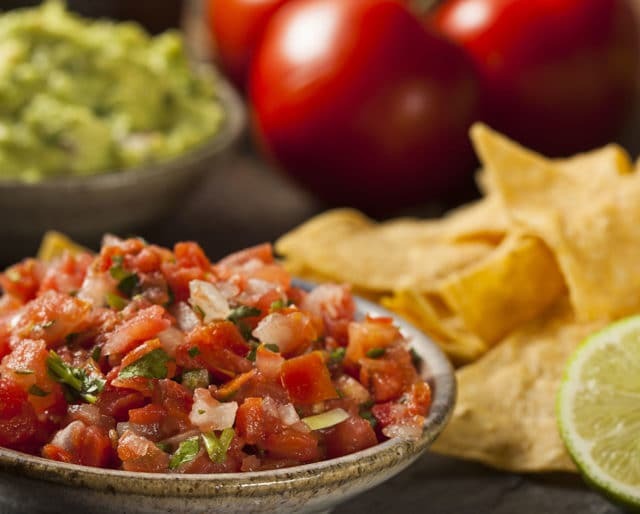 Roja, cruda, verde, negra, brava...for the love of salsa! We've heard of people bonding over a bowl of salsa. With some chips and tacos to share, you will never be short of friends. First, it's full of vegetables. Second, its got vitamin C, lycopene, and fiber. It may even protect against cancer!